New litter born October 2, 2009. Hi Times Boxers was established in 1992 by Joan Carcasole. 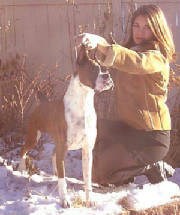 She has since been joined by her eldest daughter Ashley, and they have been breeding and exhibiting boxers together for over 15 years. In 2004 we decided to move on to a new breed. Visit HiTimes Toy Dogs to see our newest additions.